So the flathead have been around as was the case in the previous post. It is good to know that a particular species is around so that you can target them. 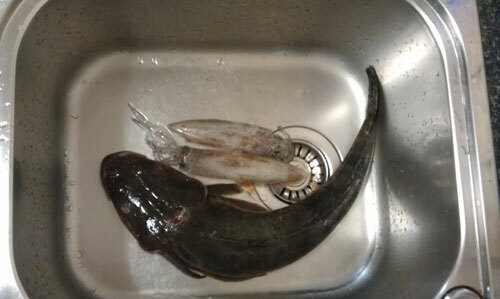 Flathead are quite easy to catch, but not quite in abundance. They are bottom feeders and are very well camouflaged with the muddy and sandy bottoms. A standard rig we would use is a bit of lead on a live or fresh bait with about a 50cm trace. You have to be fairly generous with your bait offering as they have large mouths and aren’t shy when the baits are substantial. We put out a small live yellowtail in hope of another flathead and we came up with this beauty. It measured around the 50cm mark. The fight was shortlived and predictable, but sometimes we mistaken them for a sting ray. They both take the bait and swimming around without too much of a fight, but rather with a lot of weight, quite to opposite to bream and snapper. The two squid were caught later in the day, a bit of a rough time squidding. It took the good part of two hours to get the two, but will make great bait for our next trip.